And if that photo isn't clickbait, then nothing will draw more readers to this blog. 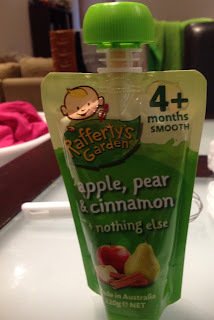 Originally, I wasn't going to review Rafferty's Apple, Pear and Cinnamon. It seemed too obvious, given I had reviewed Wattie's stage one Apples yesterday. How could an apple food be that much different? How indeed. The consumption of this food, however, does raise a thorny issue, that of food miles. Originally,I had only been reviewing foods made by New Zealand companies, the food manufacturing behemoth that is Wattie's, and the smaller, some would say hipper outfit of Only Organics. On the packaging, however, there was no escaping the bold proclamation 'MADE IN AUSTRALIA'. In these less than certain economic times, and with the warming environmental climate, surely we should be buying New Zealand made, and not food that has required the expenditure of who now show much in the way of fossil fuel to arrive on our fair shores? Sure, free trade, and the one would assume inevitable TPPA may mean an influx of cheaper, brighter foreign purées on our shelves, potentially at a cost much lower than our known, previously adored and trusted labels, but should we be trusting this, buying it at the expense of companies owned by Kiwi mums and dads, and further adding to the changing if our weather patterns? Certainly some issues to chew over, or at least swallow over, as chewing isn't really necessary with this offering. Great maths skills, Rafferty's Garden! No trying to pull wool over our eyes and having your ingredients add up to over 100%, like Wattie's did the other day! Also, did you know some people will class cinnamon as a superfood? What is it with babyfood manufacturers and superfoods? First Impression: I noted the apples on the packaging are closer to the eating varieties you would normal associate with a child's lunch, probably a Braeburn or a Royal gala, which gave the expectation of perhaps a sweeter product. The pear pictured appears (haha, there's a pun for you right there!) to be a Packham, or perhaps a greener Doyenne du Commice, both firmer, juicier varietals which would be good for puréeing into a palatable product. Cinnamon sticks in an artistic bundle complete the packet art. The purée itself is of a fairly standard texture: not too runny, but smooth in appearance. A pale yellow-brown colour was punctuated with darker flecks of brown, presumably the cinnamon shining through. Emily's reaction: Well, I think the photo at the head of this column speaks volumes. This was eagerly anticipated, giant lunges onto the spoon removing the food before I had a chance to sequester more than a teaspoon full for myself. 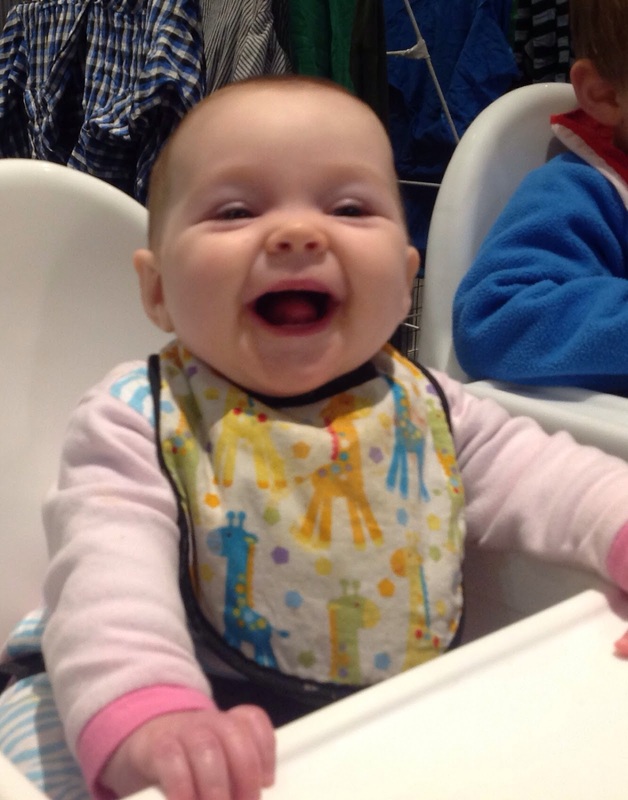 Certainly a strong favourite for Emily. Bouquet: Strong apple flavours on the nose of this one, totally dominating over the submissive pear scent. A hint of spice lingered at the back of the nose. The bouquet was sweet and enticing. Taste test: Simply delicious! A slightly thicker purée, but without the coarseness or granularity of other pear offerings. Although noticeable at first sight, the flecks of cinnamon simpy do not registrar by feel in the mouth. Again, big apple and pear components hit the palate immediately, landing a first round knock out blow, with a delicate hint of cinnamon capping off a simply devine tasting experience. The taste lingers tantalisingly in the mouth, without overstaying it's welcome. Overall: 9.5/10. The only fault I can find in Rafferty's Garden's product is the distance it has travelled to be in our pantry. Taste-wise, simply clobbers Wattie's Apple out of the park. Six runs! Enjoy with: Custard, a glass of a late harvest Muscat, and in front of an open fire with a loved one.